Dahlia Abraham-Klein offers recipes from surprisingly far-flung regions on two continents. 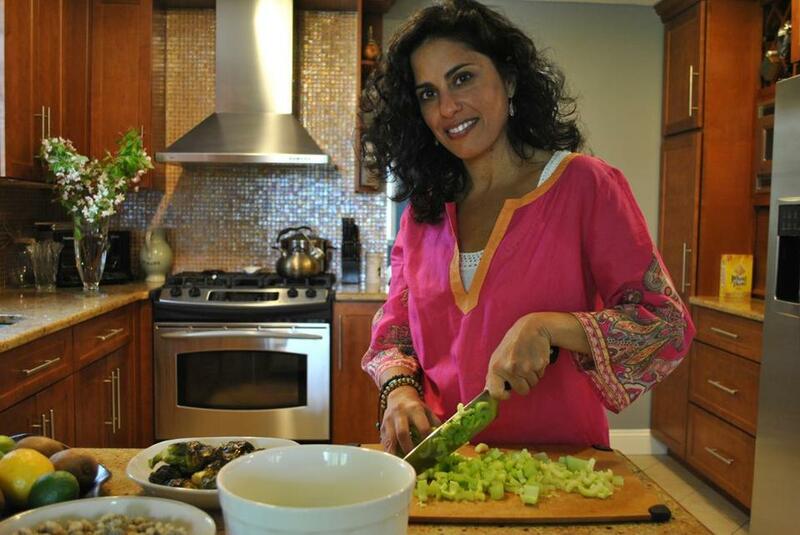 Cooking teacher, blogger (Silkroadvegetarian.com), and distribution facilitator for a Long Island CSA farm, Dahlia Abraham-Klein arrives at her first book through a combination of her central Asian-Jewish heritage and her own dietary struggles. “Silk Road Vegetarian” is vegan, vegetarian, and gluten-free, a combination that fits naturally with nomadic foodways, where meat is a scarce commodity and rice a traveler’s staple. As a result, the book feels like a compendium of vegetarian stalwarts from surprisingly far-flung regions on two continents. For generations, Abraham-Klein’s family wandered between Persia, Afghanistan, and Bukhara (capital of Uzbekistan). Culinary influences in this book extend over a vast swath — Syria, India, and China. For all that, though, many dishes have a distinctly Iranian feel. An eggplant stew combines chunks of meaty eggplant with a tomato sauce that is thickly spiced with cumin, turmeric, paprika, and cinnamon. The sour allure of dried limes brightens a yellow-split pea stew flavored with a similar blend of spices. The limes also play a starring role in ghormeh sabzi, the Persian herb stew that blends finely chopped spinach, parsley, and more fresh dill than you’d normally see in an entire menu. Kidney beans and rice make a meal of it, though not a quick one. Most of these stews take a couple hours of soaking or simmering. Cucumber-yogurt dip is cool and creamy on toasted pita; the tingle of raw garlic keeps it pungent and honest. A bunch of kale, simply wilted in a saucepan with water, gets a cool sesame dressing that transforms it into something very like that cold spinach salad you enjoy with your sushi. Potato salad, generously showered with dill and lemon juice, is billed as “Middle Eastern,” but would make a goes-with-anything side dish on any North American buffet. Lemony roasted vegetables aren’t the crisp-edged, slightly shriveled kind we all love, but a heap of softened potatoes, onions, and peppers that might be great with fried eggs. This dish of long-grain brown basmati rice has a lighter hand, and the textures mingle subtly on the tongue. There’s a palak paneer (spinach curry from India) that uses tofu instead of paneer, which renders it vegan if slightly less interesting. It’s so good, the “serves 6” yield proves totally inadequate, leaving two hungry people desperate for more. 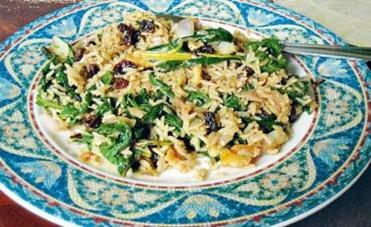 Swiss chard pilaf may be the dish most typical of its roots. It is scattered with whatever greens, dried fruit, and nuts one has on hand. Faintly reminiscent of the Italian way of preparing chard, this dish of long-grain brown basmati rice has a lighter hand, and the textures — toasted walnuts, caramelized shallots, softened currants, ginger — mingle subtly on the tongue. Abraham-Klein’s gluten-free and vegan dessert solutions rely on substitutes like gluten-free flour mix, vegan butter. Lacking either, I made orange-almond cookies with regular flour and butter, resulting in a mildly scented cookie that was probably a bit more elastic in texture than the original. I’d be content to have it in the absence of more traditional sweets. In a market crowded with Middle Eastern and vegetarian books of every stripe, “Silk Road Vegetarian” may not distinguish itself for its newness or uniqueness. And the recipe style is on the vague side. But the Middle Eastern fare and the vegetarian pantry are capably woven together here into a compact volume. Those in search of that combination will not be disappointed.